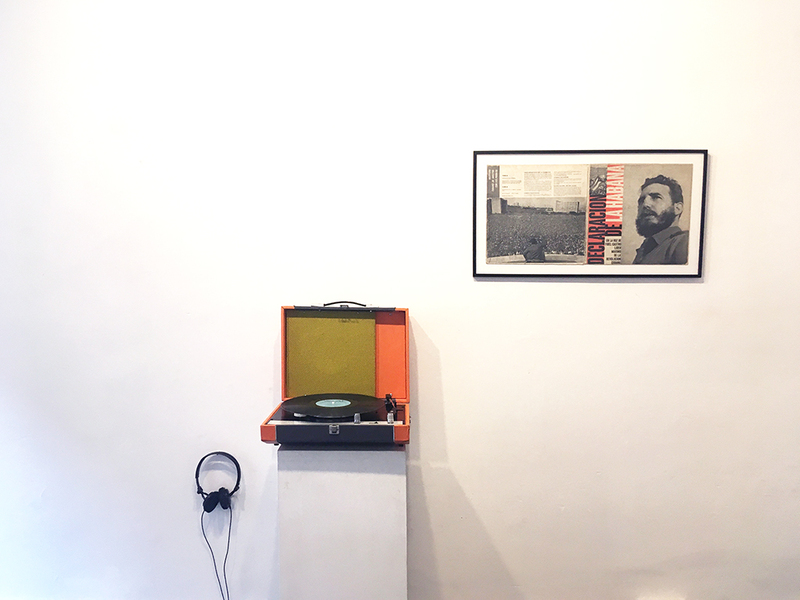 The audio installation Oradores (2017) by Miquel Garcia is a critical reflection of today’s political discourse and its intangible power relations. The artist presents four recordings of public speeches by historic dictators. Mussolini, Hitler, Franco, Fidel Castro and are heard on various Vinyl’s. Vibrant words of the past fill the present space and time, nicely portraying the imminent glorification and heroinism that accompanies public speakers. The artist, however, modifies the given discourse. The revolutions per minute (RPM) in which the recordings are presented amount to the years that have passed since the speeches were held. Miquel Garcia thereby displays a form of sonic intervention, distorting the tone, content and presented discourse of the political figures. Through this minimal intervention, the artist not only performs the most compelling act of auditory iconoclasm, but also underlines our need to ‘rethink’ our political language. By diverting the document, the artist transforms and ridicules the given discourse, as well as anticipates the moment of its destruction. For each year that passes, a further revolution is added, altering the audio to a degree of incomprehensibility and termination: call for socio-political restart. In many aspects, Oradores touches upon Adorno’s Critical Theory, by questioning current modes of cultural production, ideas of mass conformism and the body politic as such. The distorted speeches act as a symbolic indication of our need to free ourselves from the mass political language, which above all is a structure that organizes and reconsolidates our way of thinking and being. Stepping out of this socio-political construct, might allow us to return to the individual idea, community and the political reestablishment subjectivity. Miquel Garcia lives and works in Barcelona, where he Graduated in Fine Arts and Artistic Production and Research from the UB. Garcia carried out several exhibitions and residencies of national and international level. He also works in the education sector, organizing workshops with institutions such as MACBA and the Joan Miró Foundation. Miquel has worked with young artist in Medellin, Manizales, Bolivia, Sao Paulo, Palestine, Barcelona, Bilbao and Buenos Aires. Exhibited are a series of reflective exercises that interrogate the accumulation of time. A utopian search on the possibility of finding continuous movement that portrays the volume, the weight, the comotion, even the silence of a given period. A set of operations in which the present is a combination of previous moments and possibilities of the future. The space is transformed into a stage constructed from layers of gestures and repetitions in which fragments combine to form a whole.